If there were a magical slurp of medicine that every member of a given society could ingest to guarantee a thriving democracy, research suggests that it would almost certainly take the form of a high-quality education for all. Take, for example, research that shows a 77 percent correlation between a country’s education levels in 1960 and the strength of its democracy over the next four decades. The upshot: there are close to zero countries where education levels are poor and democracy has thrived in the long term. Researchers Giacomo Ponzetto, Andrei Shleifer, and Edward Glaeser explain such findings by noting that democracy only works if a populace possesses “the skills and motivation to work collaboratively” to protect against alternative ruling systems, such as dictatorships or military coups. Other research suggests that the necessary skills for participating in a democracy do not develop naturally in children. Reading and writing, for one thing, are skills that must be taught and that enable people to effectively work collaboratively. But just as important are so-called “softer” skills, such as the social intelligence required to simply get along with others. Data shows that in the United States, at least, having had a quality education predisposes people to be active members in civic and social groups later in life. Without the underlying skills and intelligence that enable people to work together, a democracy lacks the ability to defend itself as a ruling system. It follows, then, that teachers and the classroom environments they cultivate act as one of the most important foundations for a society’s healthy democracy. Teachers are tasked with teaching students, starting at a young age, many skills (none of which come with clear instruction manuals): taking responsibility for their actions, practicing tolerance for differences and discomfort, developing acceptance of situations and outcomes that aren’t what they’d hoped, nurturing curiosity about lives unlike their own, and pursuing a desire for equally applied justice. Of course, amid these softer skills, teachers in a healthy democracy must be transmitting the lessons of history and a critical engagement with those lessons. It’s a tall task, and an often underappreciated one. But experts who have devoted time and energy to the question of how teachers best realize these important goals in the classroom have a few suggestions. Position learning not as a passive process but as an active one in which students have a role and a voice. One of the most important lessons that students can start grasping early on is that learning and improving don’t just happen to them—they have an active role to play in the process. Teachers can organize lessons to encourage students to play, participate, and help shape the choose-your-own-adventure that classroom instruction can be. Make space in the classroom and curriculum for the fact that every student is unique and learns in a different way. Citizens in a democracy need to appreciate differences, and an important precursor for acceptance of that fact is accepting a person’s individual nature as distinct from others. 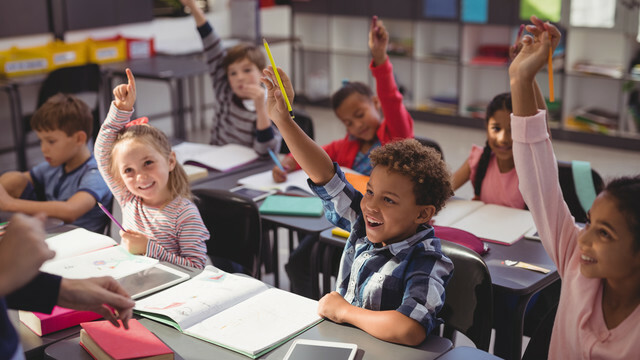 Students shouldn’t be admonished for the ways in which their learning preferences or tastes fall outside the seeming mean—these differences should be celebrated. Practice democracy by finding frequent opportunities for shared decision making. From kindergarten to high school and beyond, students benefit from having opportunities to work together to make decisions about their learning environments and subjects of study. For six-year-olds, this may mean working together to name the class fish, whereas for seniors, it more likely takes the form of working in small groups to determine the subject and scope of presentations or science experiments, but many of the skills gleaned are the same. Encourage students to identify ways they can push for positive change in their schools and communities. The role of a teacher should encourage students to look outside the classroom, too, to find ways to strengthen their growing democracy muscles. If students have valid complaints about city services, laws, or other issues that can be met with collective action, teachers can help equip them to respond with thoughtful and strategic actions to drive change. On a local legislative level, try to find opportunities to create student advisory councils so they can have immediate roles in the legislative process. Finally, consider how to encourage local lawmakers to find ways to include older students in certain legislative decisions. Not only will students see the often complicated legislative process up close, but they will also start to regard themselves as actors in a democracy that depends on their participation. Education, that crucial element in any democracy, depends on the thoughtfulness of teachers. Without a teacher’s clear conception of the role she or he is playing in a democracy, education can’t be the finely honed tool for progress and equality that it can be.